reimbursement by any insurance companies! Introducing the New CityBug Helper scooter! 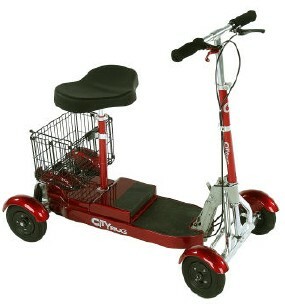 If you want the ultimate combination of speed, portability and stability, the CityBug Helper is your answer!! The CityBug is a long awaited, 5 wheel scooter for those who do not require a medical scooter, but just need something to travel the long distance's in Theme Parks, Craft Shows, Malls, Campgrounds, Flea Markets and Swap Meets! The 5 wheel design adds stability compared to other 2 wheel scooters on the market today, yet still delivers the speed you need to travel long distances! With a maximum speed of 10 miles per hour, the CityBug will get you where you need to go! With the battery removed, this scooter weighs ONLY 48 lbs. and easily folds to transport in the smallest of trunks and cargo spaces. The CityBug is ideal for transport with RV's and travel trailers, as it will easily fit in the small storage compartments, and adds very little weight to your travel load. We offer 24 hour online ordering and most orders placed before 2 P.M., EST are shipped the same day. Weight without batteries: 48 lbs. 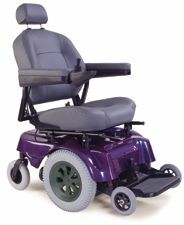 Folds down for easy transport in the smallest spaces! Key operated for added safety. Low battery cut off and low battery warning gauge. Battery pack charges in only 5 hours! Adjustable seat height and handle bar height. Custom, extra large cushioned seat. Easily removable battery pack. Separate battery packs available to eliminate down time!